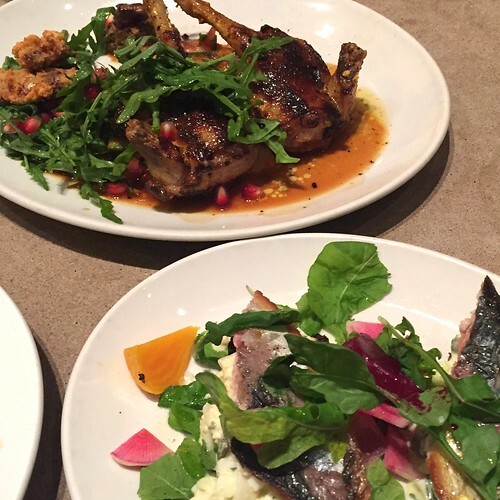 My last dinner in San Francisco took place at industry favorite and late night spot, Nopa. Multiple people had recommended it to me (both recent visitors and locals) and after a super fun but tiring day at a 49-ers game (my first NFL game ever!) in the brand new Levi’s Stadium and a nice long nap, I was ready to eat a ton of delicious food. We managed to get some seats at the bar after a half hour wait around 10 p.m. 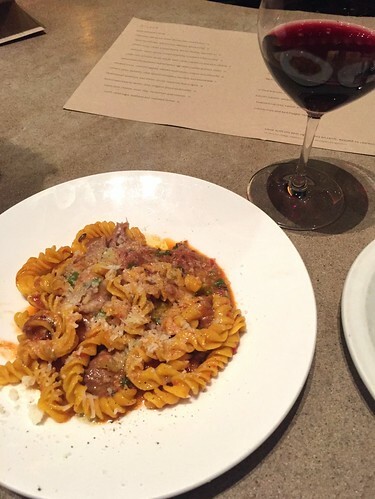 I ordered a glass of Cabernet Sauvignon, Shirdoo got one of their whisky cocktails and we started with their fusilli with lamb sugo, scallions and toasted fennel. Comfort on a plate…so warm and flavorful and perfect for a chilly evening. 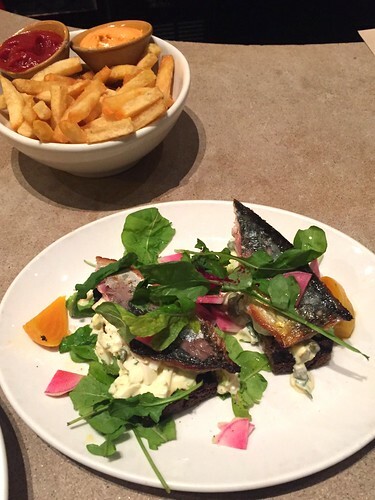 We also got the wood oven-roasted mackerel with pickled beets, egg salad, radishes and rye toast, which was my favorite dish of the night. Again, I am a sucker for mackerel and this was a really nice version that reminded me of traditional offerings at your classic New York Jewish delis. The skin was slightly charred and crispy and the meat lightly cooked and complemented by the pickles and rye. Being a total potato-whore, I also really enjoyed the french fries with ketchup and red pepper feta aioli but didn’t really pay much attention given how good our other dishes were. Last dish of the night was also a show-stopper: grilled squab with marinated potatoes and Mediterranean salad. Seriously beautiful to look at and served with all the nasty, innard-y (and yummy) bits of the bird. The flavors from the accompanying salad were also really bright and fresh, with a slight sweetness from the pomegranate seeds. We finished our meal with a couple glasses of dry sherry that the bartender recommended (service, by the way, was outstanding throughout the night) and left around midnight super full and sleepy (will also note that the restaurant was still buzzing when we were leaving). A wonderful ending to my first time in California and I will definitely be back soon. You are currently reading Nopa at Notes on Food.